The Boston Red Sox square off against the New York Yankees for Game 2 tonight. The Red Sox 5-4 win Friday against the New York Yankees in Game 1 of the AL Division Series is giving Red Sox fans a lot of reasons to be excited for Game 2 Saturday night. 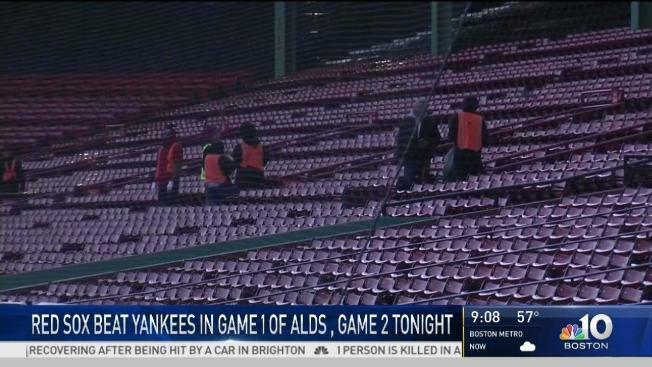 "The buzz, and just the fever for a win is really exciting, " Red Sox fan Leslie Mattimore, of Brookline, told NBC 10 Boston. Mattimore's dog Flynn, dressed in furry fan gear, is also enveloped in the emotion. "He doesn’t wash his jersey throughout the whole season so, I think [that's good luck]," Mattimore said. Throw in some Yankees fans -- an old but familiar foe -- and it's a recipe for a very tense game. Friday night's Game 1 in the Best of 5 Series was a testament to the excitement. The Red Sox managed to hold off the Yankees and win after a few nail-biters. The team's first postseason series lead in several years came to the dismay of Yankees fans like Keith Ranaghan. "They didn't score the runners on base. They didn't get the big hit," Ranaghan, of New York, told NBC 10 Boston. Tonight, Florida resident Dean Warley is going to watch Game 2 inside of Fenway Park. "“It’s just great to see everyone coming into Boston. For whatever side that they’re on, it’s just a really, a great energy in the city," said Warley.